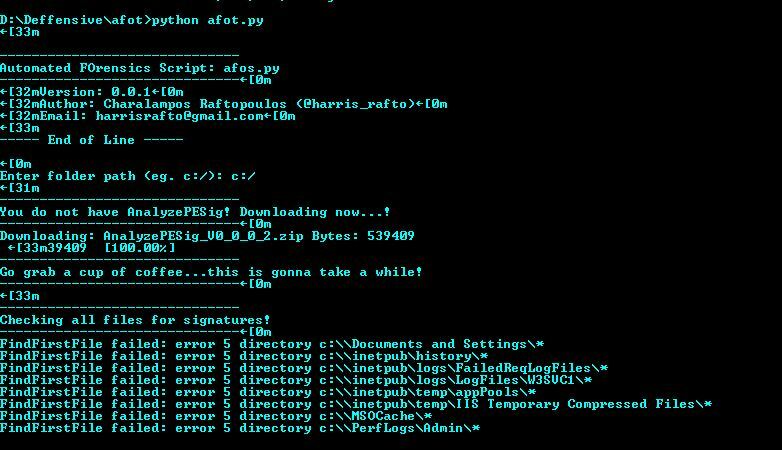 Browse: Home / AFOT – Automation Forensics Tool for Windows. + The user provides the path, which will be used to analyze all the executables included in those folders/subfolders. + AnalyzePESig looks for signed executables, whom certificate will soon be revoked. + AFOT will collect all the non-signed executables and cross-check them with NSRL’s hashset database, using the NSRL tool. + Last but not least, if any hashes were found to be in NSRL’s hashset database too, we cross-check those hashes with VirusTotal, using the VirusTotal Search tool. ← tomcatWarDeployer v0.3 – Apache Tomcat auto WAR deployment & pwning penetration testing tool.